Adrian Lam is hoping to welcome back up to four senior players for the Good Friday derby. Sean O'Loughlin and Ben Flower missed the 30-20 loss at Wakefield as they nursed minor injuries. Lam says he will assess them on Monday and is "hoping" they are fit in time for the visit of leaders St Helens. "It'd have a massive impact, because last week at Cas' we took the lead twice before they won it... had we had a senior player or two in there we may have controlled the game better," he said. Full-back Zak Hardaker may also return after missing out last night because of family reasons. Forward Joe Greenwood suffered a head-knock at Castleford and will see a specialist in the week, who will rule on when he is fit to return. "He has a chance but he's doubtful," said Lam, who hopes Thomas Leuluai's calf strain suffered last night is not serious. 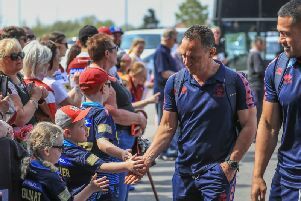 He will also be keeping his fingers crossed the RFL's match review panel did not view some of the tackles in the same way as Trinity coach Chris Chester, who labelled some of Wigan's challenges around the knees as "ridiculous". Despite a seventh defeat in 10 Super League games, Lam was optimistic and believes his side can have a strong second-half to the campaign if they can ride out this rocky spell. "We just need to hang in there and get through this period in shape," he said. "If we do that, I think we can do some damaging stuff at the back end."